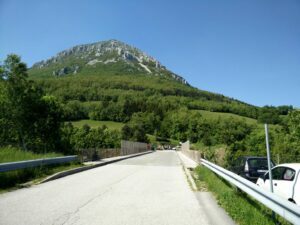 Nanos is a small mountain in southwestern Slovenia, lodged in between northern Italy and Croatia, with several summits of which the highest is Plesa (1262 meters above sealevel). 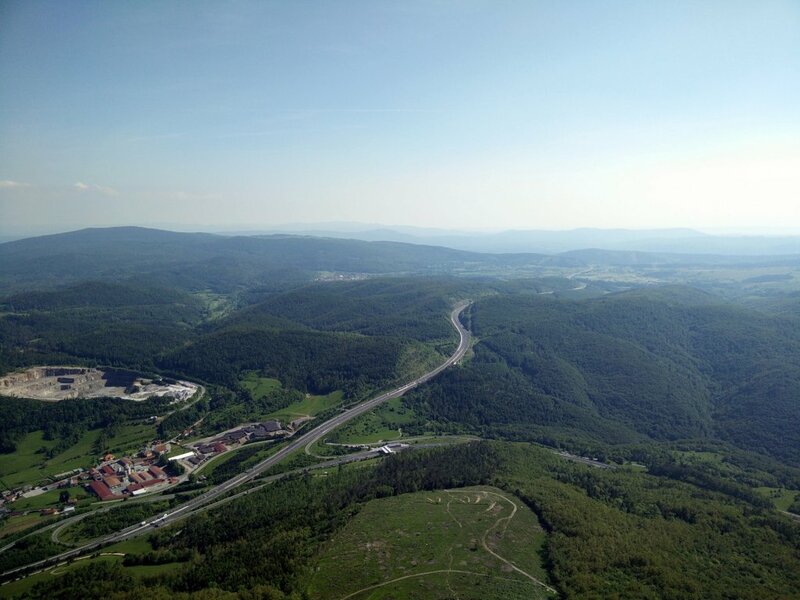 The great advantage of Nanos is that it is very easy to reach as the trans-European expressway E61 runs just below it and thus the mountain is a favorite not just among locals, but also neighboring Austrians, Italians and everyone else going to and from the Adriatic seaside through Slovenia. Nanos is also very close to tourist attractions such as the Postojna caves (which are among the biggest and most visited caves in Europe) and the Unesco World Heritage site of the amazing Skocjan caves. 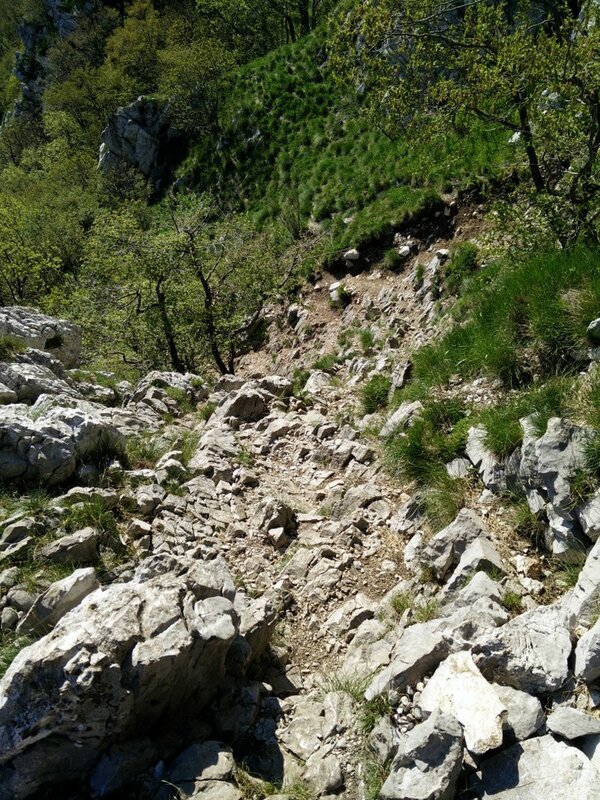 There are multiple ways to ascend Nanos (one being from the west at Podgric), but here I chose to approach it directly from the southern side to take a steep path featuring some opportunity for scrambling and a few Via Ferrata passes. 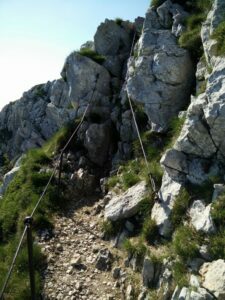 None of these stretches do, however, require an actual via ferrata set to overcome them. 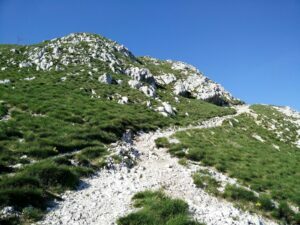 You will need a pair of good hiking boots as a bare minimum for this technically slightly challenging trail, but you will also thank yourself for wearing a pair of durable hiking pants with great freedom of movement as you will have to climb/scramble up against abrasive cliffs more than once on this trail. Depending on your physical preparedness, you can be up and down in as little as three hours if you don’t “waste time” on things such as admiring the view or having lunch or a drink in the mountain hut on the top. The vast plateau of Nanos and its various summits are definitely also worth some spending time on. 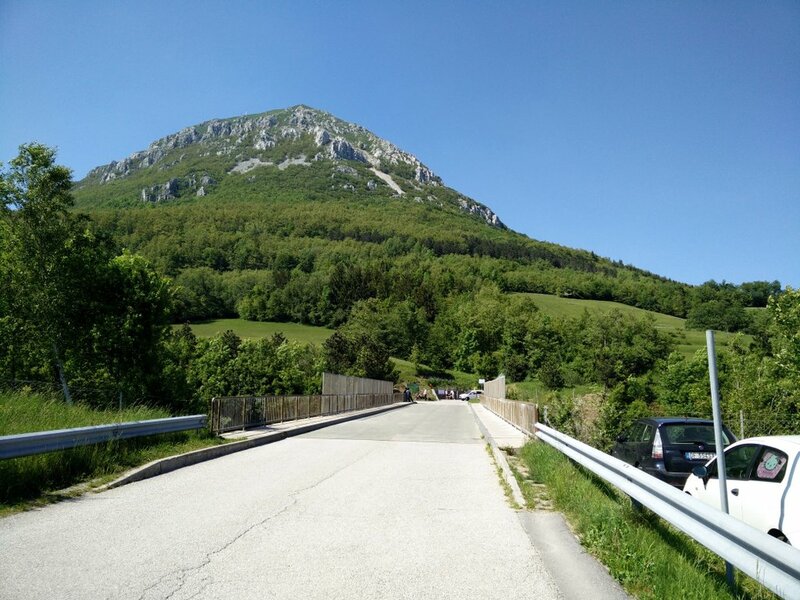 The starting point of the trail is a parking place (specially made for hikers going to Nanos) at the foot of the mountain, on the other side of the expressway E61, just behind the village of Razdrto. Therefore, when driving along E61 from either direction you need to go off at the exit which is named Razdrto as well. 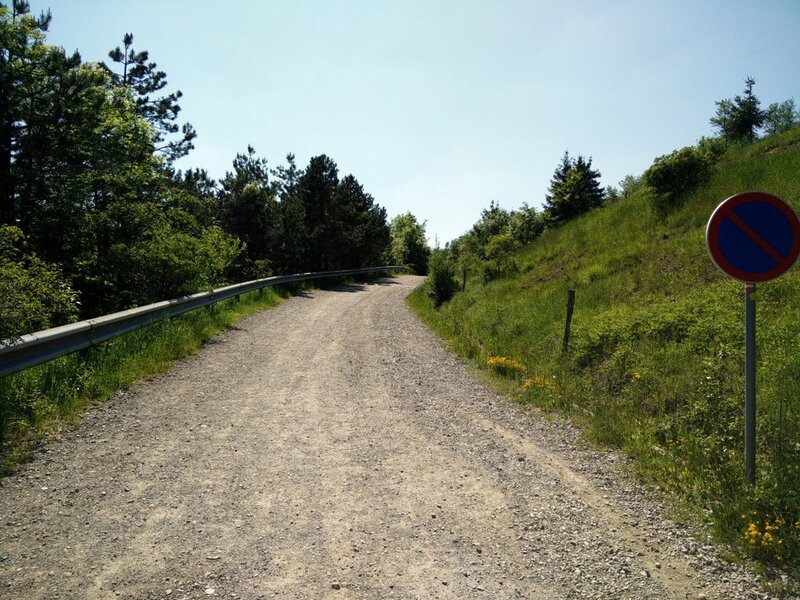 You follow the road (less than 1 km) going into the village of Razdrto and in the center of the village you will turn to the right (towards the church and Nanos behind it) at the signpost pointing towards Strane and Veliko Ubeljsko. 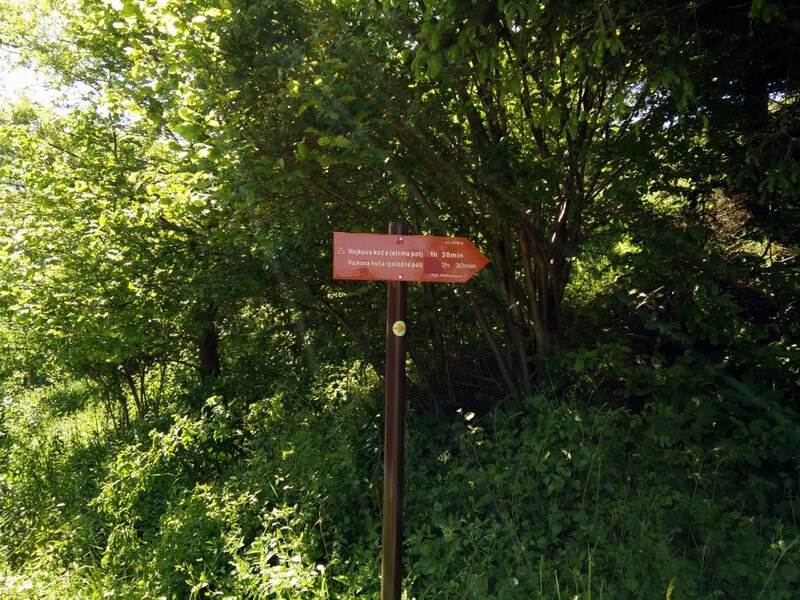 You will also see smaller green signposts with an icon of a hiker and Nanos on it. When the road splits into two after 100 meters you take the one to the left pointing straight towards the mountain. 200 meters ahead you will see the parking place on your right. If you have a GPS device you can put the address Razdrto 13,6225 Hrusevje into it. In the center of the village you can also find the supermarket Mercator if you need supplies. If you don’t have a car for your adventures – good news! 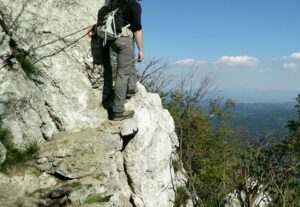 Nanos is one of the few proper hiking places in Slovenia which you can reach relatively easy by public transport. Check the bus website and write your place of destination as Razdrto or Razdrto Krizisce (further away, but more departures). There are less busses driving in the evenings and weekends, so be sure to check departure times etc. From Ljubljana, the capital of Slovenia, it is a bit more than an hour of driving; you will get off the bus either in the middle of the village (Razdrto), 50 meters from the road where you should turn right or at Razdrto Krizisce, which is 500 meters outside the village at the expressway exit. Simply follow the directions above and go to the centre of village to find the road going to the right towards Strane and Veliko Ubeljsko. Trains only go to Postojna nearby (14km), where you would anyway have to catch a bus to Razdrto. From the parking place, you cross the bridge leading over the expressway. Hereafter the road splits into two and you should follow the left one for a few meters and then take the rocky path on the right side of the road. This path is the easy track to ascend Nanos. 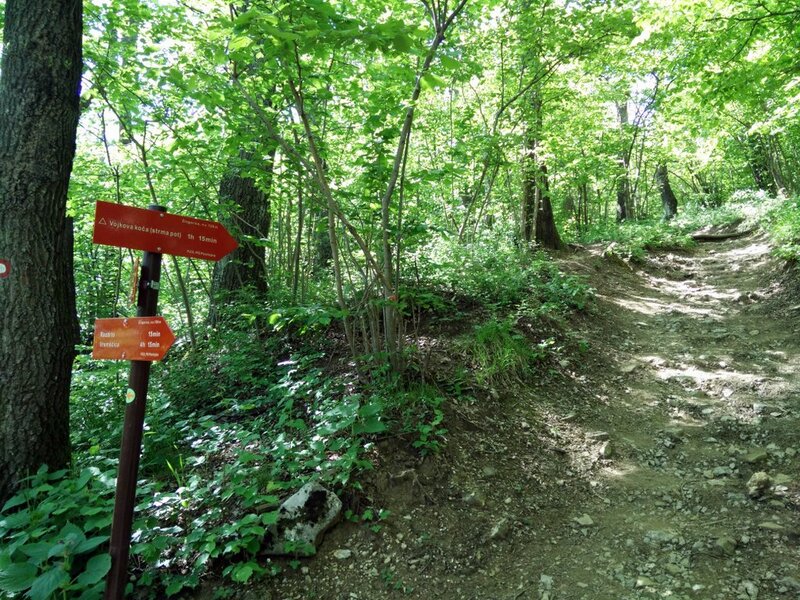 You follow this path for approximately 700 meters; then you will see a wooden signpost on your right hand and follow the path right behind it towards “Nanos – strma pot/Vojkova Koca”. 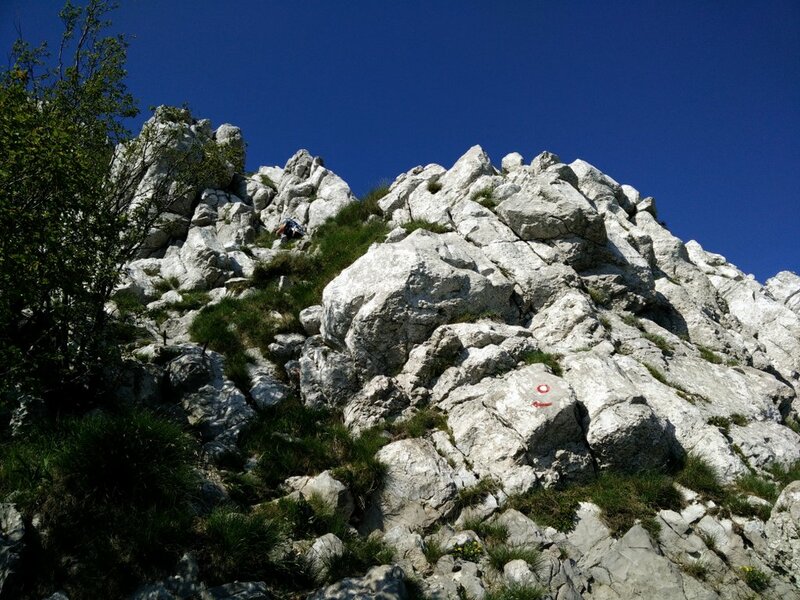 From now on the trail will either be marked with a red circle surrounding a white dot on trees and cliffs or with signposts towards “Nanos – strma pot” which means “steep path”. Indeed, the trail gets increasingly steep short after and on several places you will find yourself using your hands for help to climb/scramble up particular steep rocky stretches. 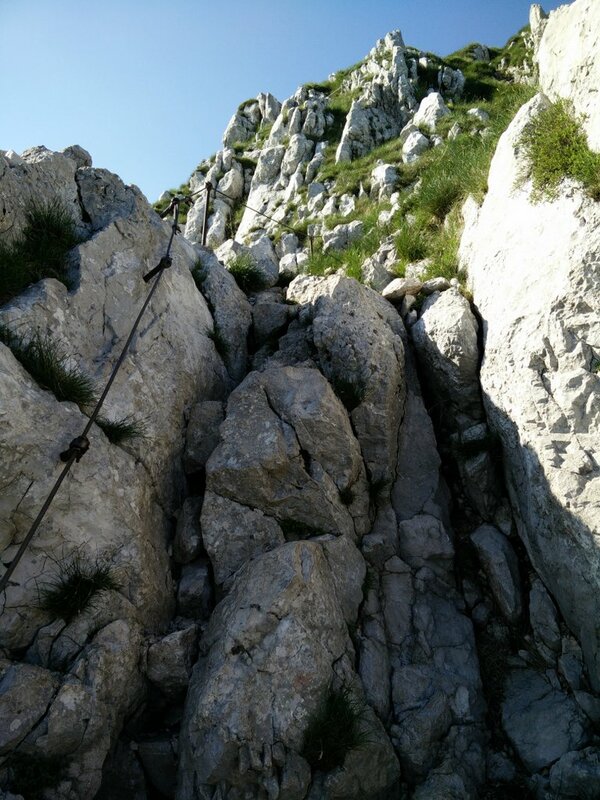 As you start getting closer to the top you will also encounter a handful of via ferrata passes, but it is only at the first one that the steel cable is 100% necessary for safe passage as the trail goes past a relatively narrow ledge with an abrupt drop below it. However, even for this stretch you don’t need a via ferrata set as it is no more than a few meters long. If you are not afraid of heights, the view is stunning. When you are so close that you can see the top with the radio signal tower, you just need to follow directions to Vojkova Koca which is the mountain hut, hidden away in a small forest on the plateau on top. It is usually open in holidays and weekends. Here you can eat hearty traditional dishes for lunch or get a drink to enjoy inside or on the outside meadow with cool improvised benches and tables made of rough tree trunks. 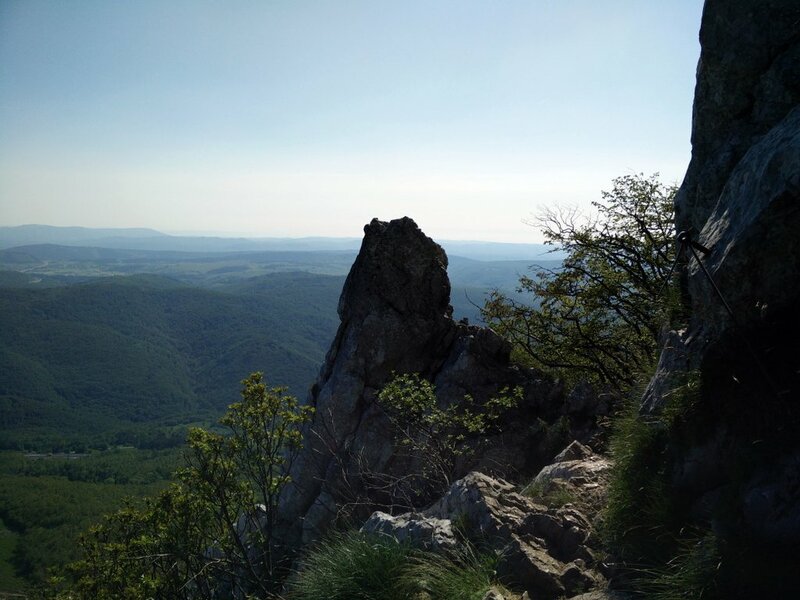 For descending the mountain I took a less steep route, the so-called “lazja pot” – easier path towards Razdrto. 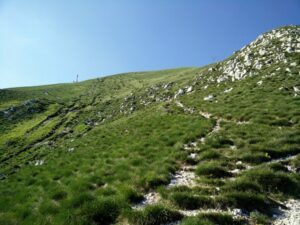 You will find signposts for this trail close to the mountain hut, which will direct you towards southwest to the ledge of the plateau. The view on the Vipava valley and the surrounding green-blue hills is exquisite. From here you will follow a narrow path parallel to the ledge towards northwest on the relatively flat plateau for a little less than 1.5 kilometers. 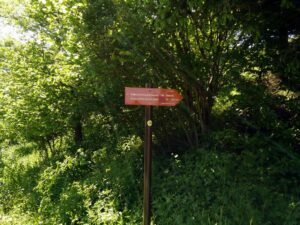 You will then come to a signpost which will give directions for various places; you need to take the path going towards Razdrto, which swings down towards northeast. From here on you will start to descend the mountain properly; only few places will it be so steep that you need your hands to ensure a safe descend. Otherwise it is a nice easy-going trail that will take you from the rocky and grassy plateau of the mountain to lush forest on its sides. The path eventually turns into a relatively wide dirt trail and you will pass by the signpost, which originally led you towards the steep trail, and continue down to the parking place and the village of Razdrto. As I arrived to the starting point by car and the weather was nice I didn’t carry much equipment with me. I was wearing a WoolPro Agena long sleeve Merino wool t-shirt, Montane Terra Pack pants, Salewa Mountain Trainer Mid hiking boots, socks made of Coolmax fibers and Woolx Merino underwear. In my Osprey Talon 44 backpack I was carrying water, food, accessories and a shell layer in case that I would encounter strong winds on the top – which Nanos is known for. However, at the time of my hike, it was completely still up there. 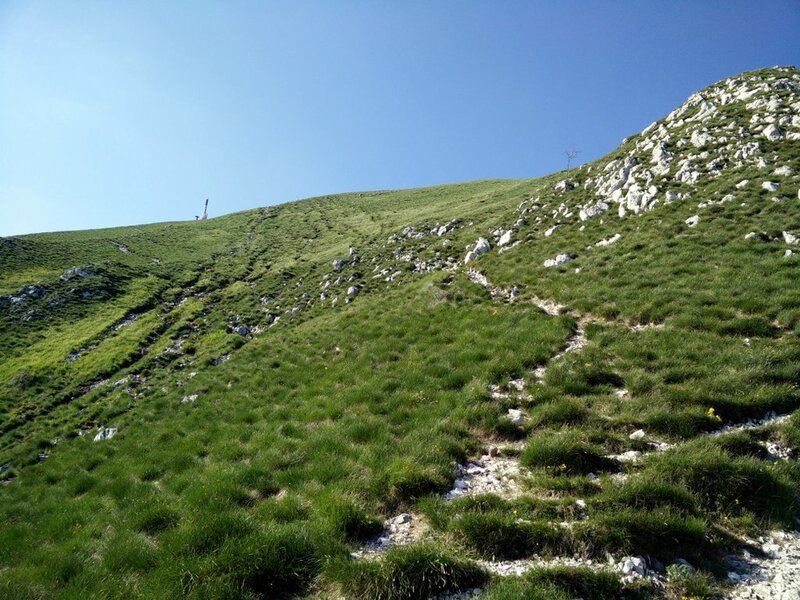 If you are doing this hike in summer time, don’t forget to bring enough water (at least 3 liters) as the temperatures get very high in this area. In winter, check the trail conditions before going as the trail might be covered with snow higher up. The Montane Terra Pack pants ensured me great freedom of movement and comfort on this hike. The pants are extremely light (they weigh merely 280 grams) and thus they are perfect for lightweight hiking. They are made of a very thin Tactel fabric which is soft to the touch and very durable. As the fabric is treated with water repellent it also offers some basic protection against rain and wind. 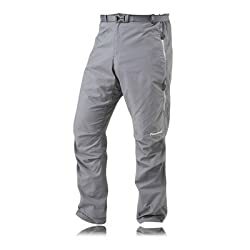 I recommend these pants to every hiker who needs a pair of durable and lightweight pants for 3-season use. Besides offering various trails of varying difficulty, the great thing about Nanos is how accessible it is due to its proximity to the expressway E61. Unfortunately, the buzz of the expressway is also heard quite clearly on various stretches along the steep trail up to the top. This is less of a nuisance on the “easy” path which runs more along the western side of the mountain where you can’t hear the hum of the road for the majority of the time. 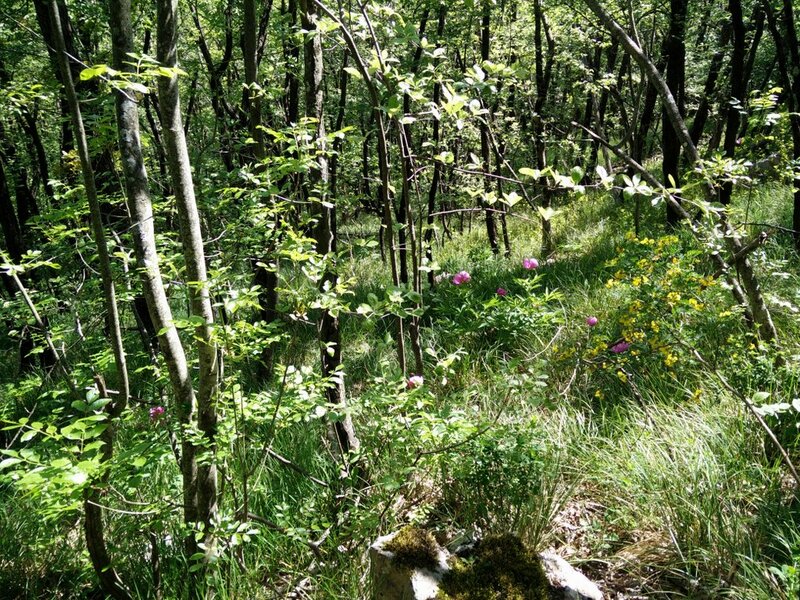 Another benefit of the easy path is that there is less forest cover and you can enjoy an unhindered view of the beautiful surroundings. Nanos might not be “must” for hikers and mountaineers, but nonetheless I would recommend the Nanos trail to anyone who is visiting the region and its sights – or driving through Slovenia and in dire need of a break in nature.